Shop our large variety of fine specialty envelopes — including invitation envelopes, translucent envelopes, business envelopes and square envelopes. Printing available. In stock items ship within 24 hrs. Shop our large variety of fine specialty envelopes — including invitation envelopes, translucent envelopes, business envelopes and square envelopes. We also offer options for security envelopes, window envelopes and more. Need your envelopes printed? 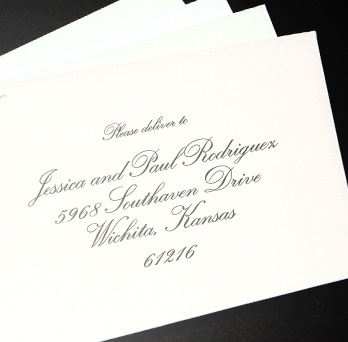 We offer fast turn-around envelope printing services including envelope addressing services. In stock items ship within 24 hrs. Welcome to the best place to buy envelopes online: The Paper Mill Store. We have more than 4,000 envelopes in our selection, but don’t let that overwhelm you. The beauty of buying envelopes with us is that we simplify the buying process, helping you narrow down the many options based on your unique needs, budget and preferences. The Paper Mill Store offers fine-quality envelopes for all your sending needs as well as affordable business envelopes that you can use for professional correspondence, marketing, billing and more. We have high-quality linen envelopes, translucent vellum envelopes, embossed envelopes and other elegant options that will beautifully complement invitations, announcements, save-the-date cards and holiday cards. Opt for stylish yet affordable bulk colored envelopes for a pop of flair or keep it simple with a crisp, finished white envelopes in a dressy texture. For commercial applications, we supply a huge assortment of fine-quality yet economical business envelopes with special features like address windows, quick seals and more. Need envelopes printed in a flash? The Paper Mill Store is happy to take care of that for you. Ideal for creating custom-printed envelopes for weddings, events, marketing purposes or for recipient addressing, this service can help you save time and stand out! Simply choose your envelope, customize it with your design and we’ll get to work printing it in time for your event or deadline. Whether it’s colored envelopes, bulk #10 envelopes, brochure envelopes or anything else you can think of, The Paper Mill Store is happy to help you find it. With supplies by top mills like Neenah Paper, Mohawk Fine Papers, Leader Paper Products and more, you’ll certainly discover a paper stylet that suits your unique needs. Use our online design and pricing tools to custom print on almost any envelope — or send us your artwork. We'll save your designs for easy reordering. Browse brand name envelopes from leading paper mills in a wide range of colors, sizes and styles. Print in full color on the front and back, from as few as 50 envelopes to 50,000+. Customize your envelope online or send us your own artwork. Review your design for accuracy & approve before placing your order. 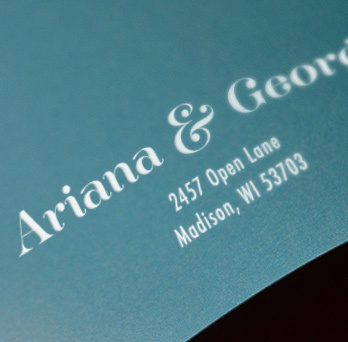 Professionally print beautiful, contrasting white ink on dark envelopes to truly stand out. Recipient addressing makes your life easy. Let us add the addresses to your mailing.